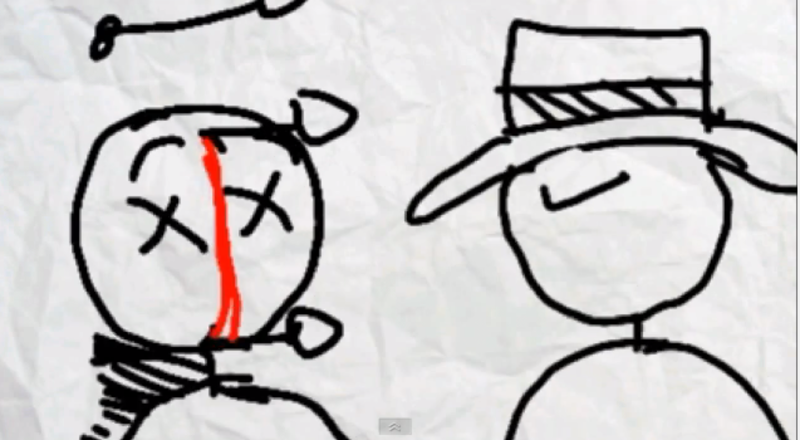 I'm enamored with "Stick Figure Cinema," a series of shorts by my friend Damian Arlyn. Silent save for an old fashioned projector noise, they're crudely animated renditions of famous scenes from great films: Indiana Jones escaping the collapsing temple at the start of "Raiders of the Lost Ark": Marge Gunderson from "Fargo" happening upon the woodchipper; the end of "Se7en" with the mysterious box; the scene with the sports car in "Ferris Bueller's Day Off." He started doing them mainly to amuse himself. The filmmaker compacts the storyline a bit. You're not seeing a point-by-point or shot-by-shot re-creation of the scenes, but an account of their boldest gestures. It's the gestures that jump out at you; they make you realize that classic movie scenes often come down to little things that people do with their faces or bodies. I didn't realize, for example, that you can boil down the dramatic importance of that entire woodchipper sequence in "Fargo" to one gesture, Marge pointing to the badge on her hat. I also didn't realize how little detail was necessary to evoke the climactic sequence of "Se7en." The shots are vividly composed, with stark. flat colors and an overwhelming brightness, but in the end they're really defined by the outlines of human bodies on horizon lines, sometimes accompanied by electrical towers or power lines slashing across negative space. The little directorial flourishes are also lovely. Watch for the shot at the 1:00 mark in Damian's version of the "Ferris Bueller " clip, when the "camera" booms past the "actors" to reveal the wrecked "car"below the house. I didn't really appreciate what a magnificent shot this is until Damian re-drew it in black, white and red. More are on the way, or so I'm told.